Select your date of visit and save up to 41%. Collect your Wristbands on arrival, or have them delivered to your home address when you book 7 or more days in advance for a peak day. For greater flexibility when planning your day, choose an Open Dated Wristband, valid for one visit ANY DAY during the 2019 season. 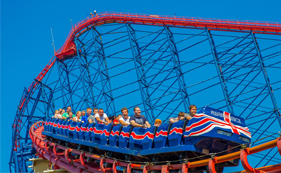 The perfect way to experience Blackpool Pleasure Beach over the Easter holidays. Giving you an Unlimited Ride Wristband for EVERY DAY until 28th April 2019.